That’s right, the FSPA is giving away another pinball machine and you get a chance to WIN by playing a season of pinball in the FSPA! 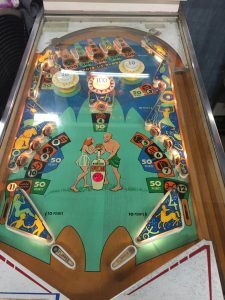 (*) The more seasons you play, the better your chances of winning — whether you’re a pinball wizard or a beginner just having fun. 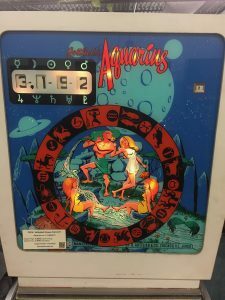 #17 — 2017-2018 giveaway cycle: Aquarius, a fun single player game, designed by Ed Krynski and manufactured by Gottlieb in 1970. For more information visit Aquarius on the Internet Pinball Database. The images below are of the actual FSPA prize machine. (*) All you need to do to be entered into the Aquarius drawing is playing in any of the FSPA leagues (CarPool/Red Zone Grill, Silverball Sanctum, Spinners, VÜK, or VBH) during the Fall 2017, Spring 2018, or Summer 2018 seasons. Playing in multiple leagues/seasons will give a player multiple entries. Player must play through a full season in good standing (all dues paid and not forfeiting season), and must have joined the league prior to the start of week 3 for any given season. Machine will be given away as-is, where-is. Winner is solely responsible for transport of machine. If winner fails to take delivery of machine within 60 days of contest drawing, their prize is forfeit. Any questions/decisions/discrepancies will be handled by the FSPA Association president.